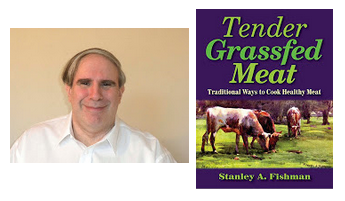 Meat Lovers May continues as we talk to Stanley Fishman, author of the books Tender Grassfed Meat and Tender Grassfed Barbecue, as we learn the best way to cook grassfed meats. Stanley shares his story about how he discovered the Weston A. Price Foundation and pastured beef. Stanley gets into the best things to marinate grass fed meat with. He also talks about cooking other types of meat, such as bison and lamb.